The date in the photograph is wrong. 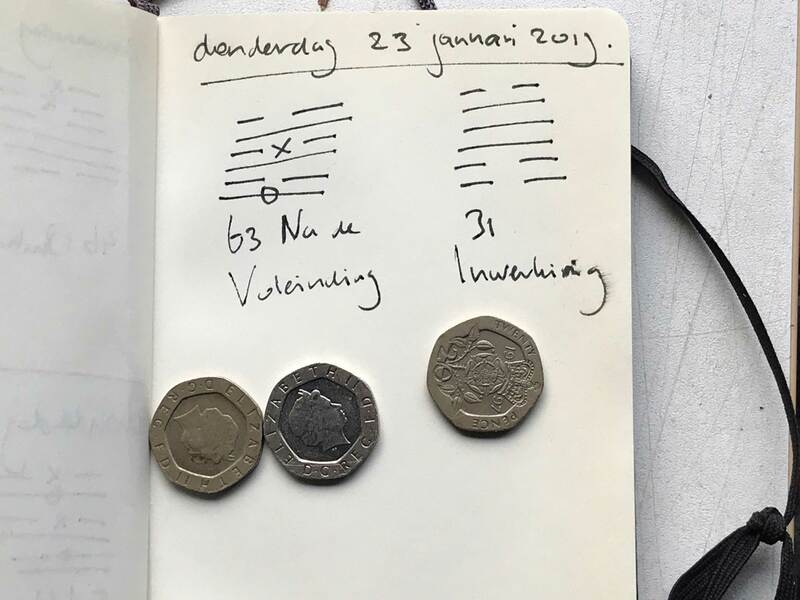 Today, the day i threw for the I Ching, it is the 24th. This hexagram is the evolution of T’ai PEACE (11). The transition from confusion to order is completed, and everything is in its proper place even in particulars. The strong lines are in the strong places, the weak lines in the weak places. This is a very favorable outlook, yet it gives reason for thought. For it is just when perfect equilibrium has been reached that any movement may cause order to revert to disorder. The one strong line that has moved to the top, thus effecting complete order in details, is followed by the other lines. Each moving according to its nature, and thus suddenly there arises again the hexagram P’i, STANDSTILL (12). The name of the hexagram means “universal,” “general,” and in a figurative sense “to influence,” “to stimulate.” The upper trigram is Tui, the Joyous; the lower is Kên, Keeping still. By its persistent, quiet influence, the lower, rigid trigram stimulates the upper, weak trigram, which responds to this stimulation cheerfully and joyously. Kên, the lower trigram, is the youngest son; the upper, Tui, is the youngest daughter. Thus the universal mutual attraction between the sexes is represented. In courtship, the masculine principle must seize the initiative and place itself below the feminine principle.